A new bridge over the River Tay and other road improvements will be funded as part of the area’s city region deal, the First Minister has announced. Nicola Sturgeon said £40 million would be invested in the Cross Tay Link Road project - which will link the A9 with the A93 and A94 north of Scone. This should reduce traffic congestion and improve air quality in Perth, as well as opening up potential new sites for housing and economic development. In addition to this, a further £10 million will go towards an industrial investment programme to support manufacturing businesses across the region, including Dundee, Perth, Angus and the north of Fife. The Scottish Government is committing £200 million to the Tay Cities Region Deal, with the UK Government also investing £150 million. Ms Sturgeon said the additional cash from her administration would “support transport infrastructure and manufacturing projects, benefiting people and businesses and ensuring the area continues to grow and thrive”. She stated: “As well opening up land for new housing and employment sites, the Cross Tay Link Road will reduce traffic congestion in and around Perth and improve the air quality in the city centre and Bridgend. “The £10 million industrial investment programme will help drive forward our ambitions to be a global manufacturing leader, creating opportunities for businesses right across the region. Perth and Kinross Council leader Murray Lyle described the funding for the Cross Tay Link Road as “hugely welcome”. 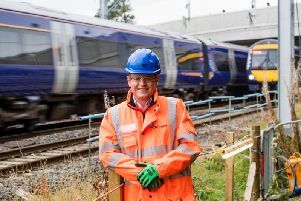 He said: “This project supports the exciting expansion of Perth and Kinross, opening up new housing, industrial development and job creation in the beating heart of Scotland. Mr Lyle, speaking on behalf of the Tay Cities Deal partnership, also stated: “This is fantastic news for the Tay cities region. We welcome the introduction of an industrial strategy which will encourage innovation and inward investment and support sustainable skills development across the whole of the Tay cities region.